For fighter info, see Sonic (SSBB), Sonic (SSB4), and Sonic (SSBU). For the universe, see Sonic (universe). Official artwork of Sonic the Hedgehog for Team Sonic Racing. 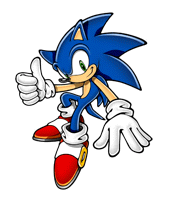 Sonic the Hedgehog (ソニック・ザ・ヘッジホッグ, Sonic the Hedgehog) is the titular character of the Sonic the Hedgehog series, and the mascot of Sega. After making a cameo in 1991's Rad Mobile, Sonic debuted a few months later in his eponymous game. In addition to succeeding Alex Kidd as Sega's mascot, Sonic was also the company's attempt at rivaling Nintendo's mascot, Mario, during the fourth and fifth generations of video games. 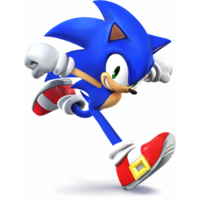 Upon debuting in Super Smash Bros. Brawl, Sonic became one of the first third-party characters to appear in the Super Smash Bros. series, a noteworthy distinction he shares with Solid Snake. By extension, the announcement of his appearance in Super Smash Bros. 4 on October 1st, 2013 gave him the distinction of being the first third-party veteran in the series' history. With the release of Super Smash Bros. Ultimate, Sonic has appeared in more Super Smash Bros. games than any third-party character. 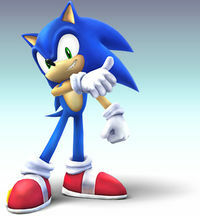 Sonic is a 15-year-old anthropomorphic hedgehog who, as his name suggests, is capable of running at supersonic speeds. He is 3 ft, 3 in (1 m) tall, weighs 77 lbs (35 kg), and has large quills, blue fur, and green eyes. 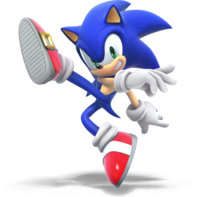 Sonic also wears a pair of Power Sneakers alongside a pair of white gloves. The self-described "fastest thing alive," Sonic is confident, quick-witted, carefree, virtuous, and adventurous to the point that he hates being constrained, yet he can also be impulsive, hot-headed, snarky and cocky. As a result of his love for freedom, Sonic always campaigns to stop subjugation of any kind, most notably the plots concocted by his arch-nemesis, Dr. Ivo "Eggman" Robotnik. Sonic gathers golden rings for energy, and when he collects the seven Chaos Emeralds, he can transform into Super Sonic, which grants him flight and invincibility so long as he has a sufficient number of rings. Initially, early Western profiles sometimes portrayed Sonic as being from the fictional planet Mobius. However, Japanese profiles (which Western territories would follow starting with Sonic Adventure) and Yuji Naka, the former head of Sonic Team, have since stated that his birthplace is Kiritimati (also known as Christmas Island), one of the numerous atolls that comprise the real world sovereign state of Kiribati. Although Sega and Nintendo were hardware and software rivals at the release of the Nintendo GameCube, then-head of Sonic Team Yuji Naka claimed that it was possible to include Sonic in Super Smash Bros. Melee. However, time constraints apparently caused these plans to fall through. It would later be revealed that both Shigeru Miyamoto and Masahiro Sakurai would have approved the idea of adding Sonic to Melee. An infamous hoax claimed that Sonic and Tails were unlockable in Melee. Despite having been proven as false, the hoax became well-known in both the Super Smash Bros. community and the wider world of gaming. Sonic, as he appears in Super Smash Bros. Brawl. Sonic is a playable character in Super Smash Bros. Brawl, and was confirmed on October 9th, 2007. Fittingly, he has the fastest dashing speed in the game, and is one of the overall fastest characters in the game. Although he uses his design from Sonic the Hedgehog (2006), his moveset is largely based on attacks from a number of games within his home series. Sonic's Final Smash, Super Sonic, functions almost identically like in his home series: he is rendered invincible and can fly, yet his transformation only lasts for a fairly short amount of time. Sonic also appears very late in Brawl's Adventure Mode, The Subspace Emissary, in which he plays a pivotal role in the defeat of the Subspace Army's leader, Tabuu, during the final battle. Sonic possesses amazing frame data and movement options alongside an effective combo game, which enable him to rack up damage very reliably. However, his strengths are almost completely offset by his severely unimpressive KO potential and most of his moveset generally having minimal utility. Despite his flaws, Sonic has managed to achieve decent tournament results, even at the national level. As a result, he is currently ranked 22nd out of 38 on the tier list, placing him in the D tier. Sonic, as he appears in Super Smash Bros. 4. Sonic's return to the series was confirmed during the Nintendo Direct of October 1st, 2013. Unlike in Brawl, his design is now based on his appearance as of Sonic Unleashed. This is further reflected by him now being voiced by Roger Craig Smith, who succeeded Jason Griffith in 2010. Additionally, just like iSonic Generations onwards, Sonic is also fully voiced in Spanish, French, Italian, and German. Sonic has been heavily buffed in the transition from Brawl to Super Smash Bros. 4. Sonic's previously abysmal KO potential has improved significantly, and a number of his moves have improved utility. Outside of this, Sonic's outstanding speed and mobility have improved even further, thanks to his air and fast falling speeds becoming noticeably faster. Although Sonic's recovery was slightly weakened and some of his moves, particularly his KOing options, had their lag increased, these nerfs are largely outweighed by his aforementioned buffs. Thanks to his improvements and consistent tournament success at all levels of play, Sonic is currently ranked 7th out of 55. This places him in the A tier, and ties him with Fox. Sonic, as he appears in Super Smash Bros. Ultimate. Sonic returns as a playable character in Super Smash Bros. Ultimate. Unlike in Super Smash Bros. 4, he has reverted to being an unlockable character. Sonic retains his Final Smash, Super Sonic, but its function has been altered: while it still launches foes on contact, Sonic's speed is rapidly increased to the point where he automatically moves horizontally across the screen, so only his vertical position can be controlled. Sonic can potentially be the first character unlocked in the game as the first character in Mario's character unlock tree. Sonic has appeared in more Super Smash Bros. games than any other third-party character. By extension, he is the first third-party veteran in the series' history. Sonic is the only third-party character to undergo a redesign between games. He uses his Sonic the Hedgehog (2006) design in Brawl, and has used his design as of Sonic Unleashed in both SSB4 and Ultimate. Despite not being able to swim in his home series, Sonic can do so in the Super Smash Bros. series. However, to reflect his adverse mobility in water in his home series, he is one of the slowest swimmers in the series because of his very frantic swimming style. In Super Smash Bros. Ultimate, this trait is further accentuated, as Sonic receives damage while swimming. Ironically, real-world hedgehogs can swim, but have difficulty getting out of water. Sonic is the only playable character whose console of origin is the Sega Genesis. He appeared alongside Mario and every other character from the Mario and Mario-related universes (except for Piranha Plant and King K. Rool) in the Mario & Sonic series. He appeared alongside Yoshi and Link in DLC levels for Sonic Lost World. He and Mega Man were the stars of two crossover mini-series in the Archie Comics, the second of which also featured appearances from Ryu and Ken. He appeared alongside Pac-Man, Ryu, Ken and Bowser in the movie Wreck-It Ralph. While Mario and Snake did not appear, the Super Mushroom and the "!" alert icon from Metal Gear (accompanied by its signature sound effect) did make cameos in the movie. The former was also mentioned, and originally planned to be in the movie. Sonic also stars alongside Ryu in the sequel Ralph Breaks the Internet. He and Bayonetta are downloadable guest characters in the Japan-only game Samurai & Dragons. He, Ryu, and Snake have costumes based on their designs in LittleBigPlanet. He, Ryu, Snake, and Cloud have costumes based on their designs in LittleBigPlanet 2. In a special event in 2018, Pac-Man was announced as a playable guest character in Sonic Dash, with Sonic simultaneously making a guest appearance in the mobile port of Pac-Man, complete with his own exclusive level. Sonic and Ryu both appeared in the film Ready Player One. A custom character outfit for Joker appeared in Sonic Forces as DLC (alongside other SEGA characters). Sonic is the only playable character in the Super Smash Bros. series to have appeared in an EC-rated game. Sonic is the only SEGA character whose franchise is mostly E-E10+ rated, and who does not use a gun in his moveset. Sonic and Kirby are the only playable characters to make a cameo in a game released before the proper debuts of their respective series. ↑ Sonic the Hedgehog (16-bit) (Sega Mega Drive) United States instruction booklet, p. 2. ↑ (2011) Страна игр 317 (in Russian). GameLand. This page was last edited on April 21, 2019, at 14:05.